Thank you for the materials you sent me. I enjoyed the articles very much. Thank you for the information about the study groups and thank you for your time and effort in getting the materials to me. I really appreciate it. I just wanted you to know that I’ve been a seeker for many years, always searching for that secret, hidden knowledge. That one thing that would make my life more meaningful. I’ve always felt that I was missing something; I just didn’t know what. Books have been the main source for my quest. I thought that if I accumulated enough books about philosophy, psychology and various wisdom traditions I would eventually find what I was looking for. I figured that if I surrounded myself with the wisdom of the ages somehow that knowledge would come to me. I’ve read hundreds of these books and while many seemed to be pointing to the right path, nothing ever stuck. After years of searching and collecting, I forgot the reason why I started in the first place. I found myself just accumulating obscure books, my quest being forgotten. I’m not sure if I would have ever even started looking again if it wasn’t for this unlikely set of events. Early one morning in March 2009 I received a phone call from my son that would change my life. He asked me to drive one of his friends home who had passed out at this house. I reluctantly agreed to help him just as I had done so many times before. I should have known better. I should have called 911. I didn’t realize that something was seriously wrong. I had a monumental lapse in judgment. I made a mistake that I felt could never be forgiven. As far as I was concerned my life was over. I had just walked into a Course in Miracles Study Group hosted by A Course in Miracles International based in Wisconsin Dells, WI I couldn’t understand what it was, but I felt like I was being welcomed home. It was a wonderful 45 minutes that changed everything. When it was time to leave I was handed a booklet entitled “A Course in Miracles Workbook Lesson 1-50”. On the first page of the pamphlet was written “The purpose of these workbook lessons is to train your mind in a systematic way to a different perception of everyone and everything in the world”. I immediately realized that this was exactly what I needed. I walked back to my cell with tears in my eyes and a feeling of hopefulness for the first time in almost a year. After seven weeks and four Course meetings I was transferred to a Medium Security Prison. I was equipped with my workbook lessons and the knowledge that things were not always as they seemed…. Now I had a great desire to live. This new Medium Security Prison was quite a bit different than the last one. I had a lot more freedom but there were no Course meetings. They did have a Buddhist group so I signed up for that. I started studying Buddhism but I also kept reading my workbook lessons. I noticed quite a lot of similarities between these two schools of thought. My eyes nearly popped out of my head! I asked where the book was from and my fellow inmate told me to stop by his room after I was moved in. Later that day he handed me the name and address of Spirit Light Outreach. I asked my daughter to go online and see if Joe Wolfe would send me a copy of the Course. A few days later my copy of A Course in Miracles arrived. I now feel that my search is over. The Course is all I need. I can’t wait to be reunited with my children and grandchildren. I can’t wait to start the next chapter of my life. 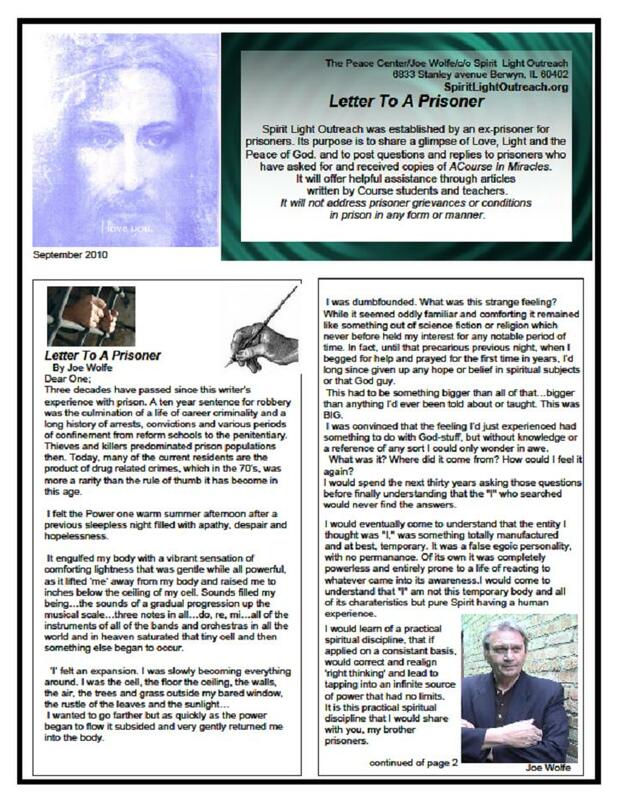 *Richard continues to write and to share his experiences while studying A Course in Miracles in prison. Our CIMS Blog will be providing a “BLOG within a BLOG” for Richard and his future letters will be posted there. So, who are we and what do we do? We are a Ministry; a Prisoner Ministry. YOur focus is Spiritual and on the individual looking for help. We freely offer a variety of spiritual reading materials. We provide a year-long Spiritual Recovery Correspondence Course for those in need of a more structured Program. 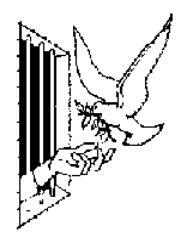 We also offer Spiritual Training Classes on-site for those who are physically incarcerated. Since early in 2007 the efforts to deliver a message of hope as offered in A Course in Miracles to prisoners have been ongoing. Prisoners have been a pet project for this writer for several reasons. The first of these reasons might be attributed to the personal experience of having served most of a ten year sentence in prison, but the greater reasons have to do with what occurred while there. It was 1974 and I was twenty-four years of age at the time. My own history up to that point was one like so many stories of a young street thug, growing up in a working class Chicago neighborhood, discouraged and disillusioned by the mediocrity and grind of what life had to offer. That there had to be something better was always a predominating thought. So ‘better’ for me, was the excitement and the radical comradity of our little clique of thugs, always plotting, always stealing, always looking for that thrill. So when those activities resulted in my first arrests, confinement in juvenile punishment facilities and finally in a ten year prison sentence,( the big time), I was brought to a juncture. I would crash and burn. Previously embraced justifications for my anti-social behavior would soon be shattered and all of the glamour of the life of a criminal would cease to contain even a trace of validity. The underlying conviction that there had to be something better still remained but now (after the experience I’ll describe below) that something would take on an entirely new and remarkable definition. The real Me…The I…The Essence of Who and Where I AM emerged for just a few short minutes one summer afternoon after an entire sleepless night of worry and immense fear over the possibility that I might be killed the following day. For the first time in many years I turned to the God I perceived and I prayed for deliverance. I begged and prayed for many hours with fever and intensity never before offered. ‘He’ answered…’ He’ delivered me. And for a few brief moments ‘He’ lifted Me from the body and embraced Me as a loving Father does His Son and assured Me once again, that I would be alright. 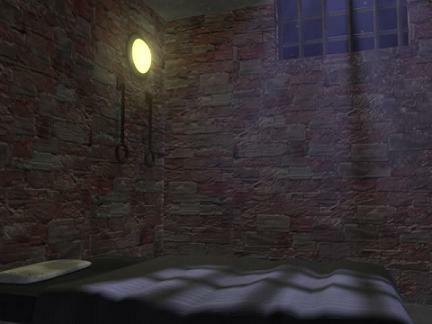 While the body lay on the prison cell cot below, the awareness of “I” expanded to include every molecule of air around Me… every feature, the sunlight that streamed through the barred window, the trees and grass outside, the room itself…everything was Me. A crescendo of ‘sound’ accompanied the experience that completely absorbed all sound on earth and played as every instrument in every orchestra all over the world, in perfect harmony. Now, many years later, and after much search, many books, and after the message of Forgiveness as gently prescribed in A Course in Miracles, I came to realize that the ‘person’ who searched would never find the answers. That person, a product of the same thought system that created him, would seek and never find because he was simply in the way. His beliefs, his concepts and ascribed personage blocked the very awareness of that which he sought. He had to get out of his own way first. He had to surrender his own image of who he thought he was before any Real knowledge could enter. The Law of Forgiveness would lend him the means to do just that. In Forgiveness, the little self would fade into the oblivion from which it came and what would emerge is what was there all along. That Essence of the Real Self, that “I” and that assurance that everything would be alright. And from that Essence a Power uncommon in this perceived world would accompany it and everything would change for the better, forever. Today, almost every day this writer visits the local post office to deliver copies of the original edition of A Course in Miracles [donated by Course in Miracles Society] along with an easy to comprehend introduction to The Course as made available through the text version of Gary R. Renard’s The End of Reincarnation to lists of prisoners who have expressed the desire to learn more about the Course. With the text version is a brief essay describing what is referred to as The Five Signs, five mystical experiences during this life which led to adopting a practical application of the spiritual discipline taught in A Course in Miracles. With the help of people like Jon Mundy and his Miracles Magazine, Regina Dawn Akers and her The Holy Spirit’s Interpretation of the New Testament, Gary R. Renard and Tami Simon, (The End of Reincarnation) and Dov Fishman of The One Mind Foundation and Acim Gather, as well as Beverly Hutcheson, Marrianne Williamson, Robert Perry, and those friends who assist with postage donations, and especially Course In Miracles Society, a new wave of compassion is spreading throughout the populations of prisons all over the country. For many of these prisoners, long forgotten by family or friends, this new avenue of communication brings welcome relief and a gentle, warm and loving response to their cry for help. It brings Hope where apathy, despair and grief make their home. It delivers Love where blame, guilt and punishment saturate the atmosphere. It brings the possibility of the Peace of God to a ‘place’ where the egos appetite for misery,pain and hopelessness can now move aside to welcome a glimmer of Light. May the Love, Light and Peace of God be experienced by them, and with every second feel another moment spent in His Endless Embrace. you can help by sharing your own glimpse of Love, Light and the Peace of God. in 2005 by a brother. I have the 3rd edition combined volume handbook, ACIM. mind and an awakening in my spirit. given your (Joe Wolfe’s Spirit Light Outreach) information. Spirit? How can I better understand what I am reading to be the truth? and how can I tap into my spirit through the text? This ex-con wants to put A Course in Miracles into every prisoners hands. God showed up and the man has never been the same. in the Grand Ballroom at Old Warsaw, near Chicago at 17th Avenue and Cermak Road. Dinner includes a wide variety of ‘home cooked’ favorites, an extravagant salad bar and free cocktail. Gratuity is included. Plan to dine either before or after the lecture. to twelve-steppers and to prisoners.